If you haven’t chosen a Gravatar (a picture to go with your username), please check out this informational post from the message board (LINK). The cool thing about a Gravatar is that it can be used on other WordPress sites, too, so you won’t have to create new avatars for every username on every site. Apopka (FL) Apopka offensive tackle William Barnes was offered by Michigan. He’s a 6’4″, 312 lb. prospect with offers from Alabama, Auburn, Florida, Florida State, Georgia, Ohio State, and Oregon, among others. He’s a 4-star, the #8 offensive tackle, and #66 overall. Michigan hasn’t tried to go into Apopka much, but they did pull Jeremy Gallon from there back in 2009. Barnes might end up playing on the interior if he doesn’t get a little bit taller. Hampton (GA) Dutchtown safety Trey Dean was offered by Michigan. He’s a 6’2″, 180 lbs. 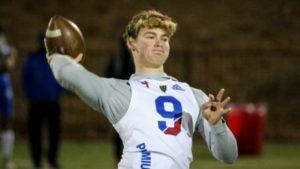 with offers from Alabama, Florida, Georgia, and Notre Dame, among others. He’s a 4-star, the #23 safety, and #284 overall. He plays some corner in high school, but I don’t know if he has the fluidity to stay there in college. However, he’s a hard hitter and a lanky kid who can cover some ground from the safety position. Hit the jump for a bunch more new offers. Fitzgerald (GA) Fitzgerald quarterback James Graham was offered by Michigan. He’s a 6’1″, 180 lb. prospect with offers from Alabama, Arkansas, Miami, and Oklahoma State, among others. He’s a 3-star, the #20 dual-threat quarterback, and #580 overall. 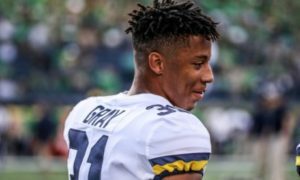 I think he has some skills as a quarterback – including the speed to be a dangerous runner in the right offense – but he also might play wide receiver or cornerback at the next level. Cincinnati (OH) Moeller defensive tackle Aeneas Hawkins was offered by Michigan. He’s a 6’3″, 265 lb. 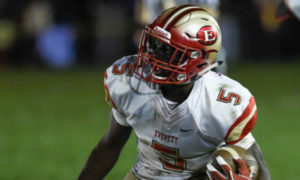 tackle with offers from Alabama, Clemson, Florida State, Notre Dame, and Ohio State, among others. He’s a 3-star, the #30 defensive tackle, and #340 overall. He plays a little like Ohio State’s Dremont Jones, a guy who could be a strongside end or a 3-tech tackle. All five Crystal Ball predictions have him going to OSU so far. Traverse City (MI) West offensive tackle Ryan Hayes was offered by Michigan. Hayes is a 6’7″, 252 lb. prospect who has been picking up steam lately with offers from Michigan State, Notre Dame, and TCU, among others. He’s a 3-star, the #13 offensive tackle, and #151 overall. 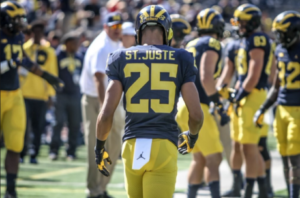 Recently, I ranked him in my top five in the state of Michigan (LINK). Traverse City West is typically a Michigan State-leaning school, but Greg Frey successfully recruited Jake Fisher from there during his last stint at Michigan (before Rodriguez was fired and Fisher signed with Oregon). Hayes plays tight end in high school, but he won’t stick there in college. 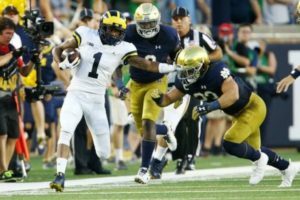 New Orleans (LA) McDonough 35 wide receiver Lawrence Keys III was offered by Michigan. At 5’11” and 160 lbs., he has offers from Alabama, Arkansas, Georgia, LSU, Notre Dame, and Oklahoma, among others. He’s a 4-star, the #41 wide receiver, and #258 overall. Keys is a quick little bugger who’s probably a slot receiver at the next level. I put in my Crystal Ball for him to LSU. Raleigh (NC) Sanderson defensive end Alim McNeill was offered by Michigan. He’s 6’3″, 270 lbs. with offers from Florida State, North Carolina, and North Carolina State, plus others. He’s a 3-star, the #42 inside linebacker, and #1092 overall. At 270 lbs. 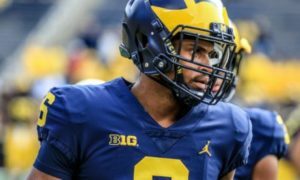 chances are slim that he’ll play linebacker in college, and he’s kind of in the same mold as Michigan’s Carlo Kemp. Olympia (FL) Olympia quarterback Joe Milton was offered by Michigan. 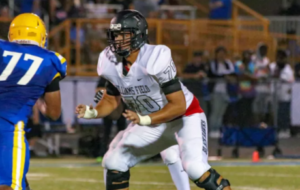 He’s a 6’4″, 222-pounder with offers from Georgia, Miami, Missouri, and Tennessee, among others. He’s a 3-star, the #12 pro-style quarterback, and #362 overall. I like Milton’s size, athleticism, and throwing abilities, but he’s a bit of a project. 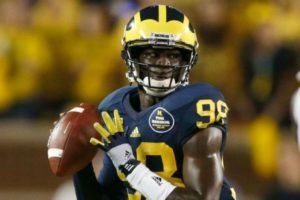 I recently projected him to Michigan (LINK). Cypress (TX) Cy Springs safety Leon O’Neal, Jr. was offered by Michigan. He’s a 6’1″, 190 lb. 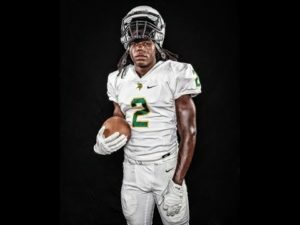 prospect with offers from Alabama, Clemson, Georgia, Ohio State, Oklahoma, and Oregon, among others. He’s a 4-star, the #15 safety, and #164 overall. He’s a hard hitter who looks like a strong safety at the next level. 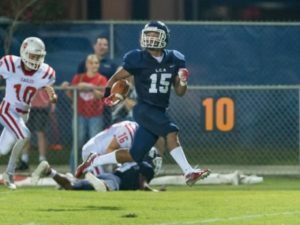 As a junior in 2016, he made 86 tackles, 2.5 tackles for loss, and 2 interceptions. Ferriday (LA) Ferriday defensive tackle Dare Rosenthal was offered by Michigan. Rosenthal is 6’7″, 290 lbs. and has offers from Alabama, Auburn, Georgia, LSU, and Oregon, among others. He’s a 4-star, the #12 defensive tackle, and #118 overall. So far all five Crystal Ball picks have him going to the home-state Tigers. At one time he was an Alabama commitment. Tucker (GA) Tucker wide receiver Josh Vann was offered by Michigan. He’s a 5’11”, 175 lb. prospect with offers from Alabama, Florida, Georgia, and South Carolina, among others. He’s a 4-star, the #37 wide receiver, and #213 overall. As a junior in 2016, he caught 63 passes for 1,286 yards and 13 touchdowns. 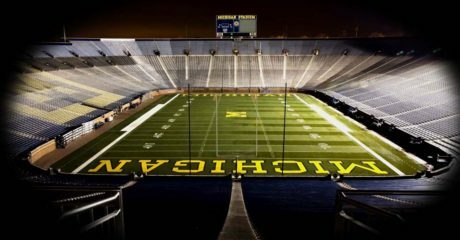 West Des Moines (IA) Dowling Catholic defensive end John Waggoner was offered by Michigan. He’s a 6’5″, 230 lb. 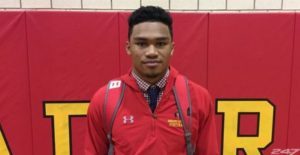 kid with offers from Indiana, Iowa, Iowa State, Oregon, and UCLA, among others. He’s a 4-star, the #17 weakside end, and #314 overall. As a junior in 2016, he made 25 tackles, 12 tackles for loss, and 8 sacks. 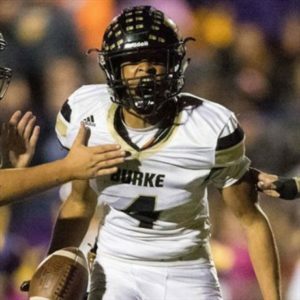 He’s the top player in the State of Iowa and attends the alma mater of Michigan’s Amara Darboh. Taylor (TX) Taylor defensive end Max Wright was offered by Michigan. 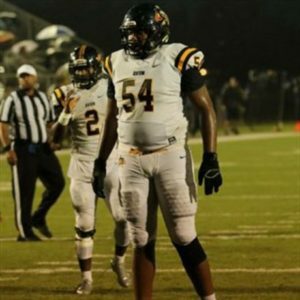 He’s a 6’4″, 270-pounder with offers from Alabama, Arkansas, Georgia, Ohio State, Oklahoma, Stanford, and Texas A&M, among others. He has eleven Crystal Ball picks to TAMU and none to any other team. As a junior in 2016, he made 70 tackles, 18 tackles for loss, and 9 sacks. He claims a 4.69 forty and a 4.38 shuttle. Mission Viejo (CA) Mission Viejo wide receiver Austin Osborne committed to Washington. He’s a top-150 player. Bradenton (FL) IMG Academy quarterback Artur Sitkowski committed to Miami. 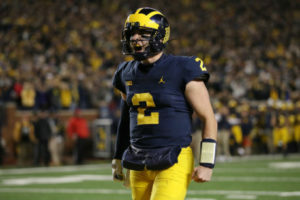 He was one of Michigan’s first quarterback offers in the 2018 class, but the Wolverines backed off of recruiting him several months ago. Las Vegas (NV) Bishop Gorman quarterback Dorian Thompson-Robinson named Michigan to his final thirteen (LINK). 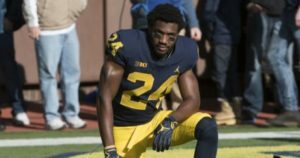 Things change and kids mature differently, but based on their high school film, Goodrich and Monday would have a shot coming in at being the best safety combination in the history of this program. Or any other program for that matter. 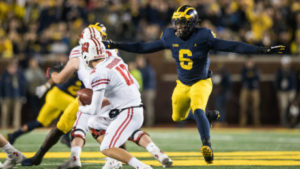 Joe Milton clearly doesn’t worry too much about which foot he’s throwing off of, or even if he has one on the ground at all. He also enjoys what looks to me like an extraordinarily big and strong batch of receivers. Aptly named from where I’m sitting.. I have a question about OT size. When did 6’4″ 312 lbs, in itself, make you have to move inside? I can understand if he’s not athletic or slow-footed but by saying that he needs to grow more in order to play tackle? You have to be 6’6″ or taller? I just don’t see the angle. If William Barnes is a great athlete and moves well with his weight he should be able to stay at tackle even if he isn’t prototypical size. That is, assuming he is ACTUALLY 6’4″, which may not be true. If he’s actually only 6’2″ I can start seeing the rationale. Maybe he has Tarik Black-itus. 1. Defensive ends themselves are often the tallest players on defense, so you have to have tall players matching up with them. 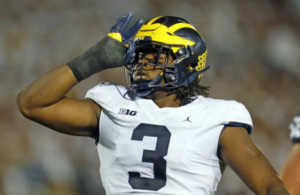 For example, the 6’6″ Taco Charlton matched up against a 6’2″ guy at tackle is probably going to end poorly for the 6’2″ guy. 2. Defensive ends/outside linebackers who are 6’6″ (or shorter) are often quicker and lighter than the offensive tackle. Having a good reach is a natural counter to having good speed. A 6’7″ guy with a 6’10” wingspan takes longer to run around than a 6’4″ guy with a 6’6″ wingspan. It might be the difference between pushing a guy too far upfield to affect the QB…and letting the DE swat the ball out of the QB’s hands. 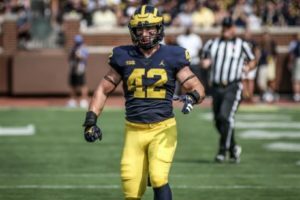 Additionally, if we’re looking for real-life comparisons, the shortest guys to play tackle for Michigan in probably the last 20 years are the 6’5″ Mason Cole and the 6’5″ Steve Schilling. Lewan, Schofield, Magnuson, Braden, Newsome, Dorrestein, Ortmann, Long, etc. have all been 6’6″ or taller. So in a practical sense, if you’re 6’4″, you’re literally not playing offensive tackle at Michigan. Thanks for the info. Sounds like Ben Bredeson, Bushell-Beaty and Ulizio are barely meeting the quota if they wind up at OT this year. 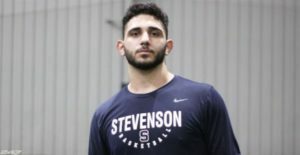 Last year there was 1 OT invited to the NFL combine who was under 6’5. This year there are none. It’s pretty much mandatory for an OT to be 6’5 at a minimum unless he has disproportionately long arms. Height for the sake of height doesn’t seem to be the issue as much as the combination of size and length that are needed are almost never going to be available in people in a human who isn’t 6’5 or more. Also, Cole and Schilling both got moved inside.